This post may contain affiliate or advertiser links. Read my full disclosure policy here. It's looking like this might be a three part series...I suppose that depends on how long-winded I get (I can hear you snickering, so hush up). :) If you are reading this post and wondering about part one, you can click here to catch up - assuming you are interested and all. We were asked to bring two pictures with us to ladies retreat (one when we were a little girl and one when we were a young woman) and during our evening session we broke up into small groups and spent time sharing our pictures and praying for each of the ladies in the group. Saturday morning was done very similar with our 'young woman' picture. The small group time and sharing about our pictures was very interesting in and of itself for me - just more amazing stuff from God and mainly it tied into my role as a mom. Saturday evening is when it got even more fun. Each of the ladies at retreat received their own prophetic word - there were over 100 women at retreat. In addition, all the ladies at home that weren't able to make it to retreat received one. Saturday evening was so much FUN! Some of the words were shared to the group as a whole and then we broke up into our small groups again and each were given an envelope with our words. One word to sum each one up: AMAZING. As the women around the room were opening their envelopes, you heard laughter, quiet, and crying. The words were truly amazing. Each one was such an encouragement to the women. I am going to post mine here for you to see - and to me it was such a confirmation of what the Lord had been speaking to me (and yes, I cried). 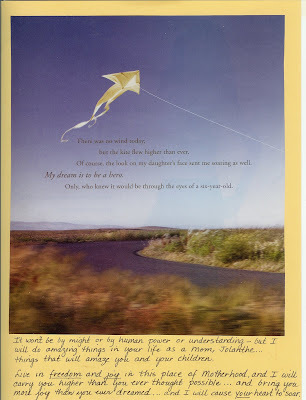 "There was no wind today, but the kite flew higher than ever. Of course, the look on my daughter's face sent me soaring as well. My dream is to be a hero. Only, who knew it would be through the eyes of a six-year-old. It won't be by might or by human power or understanding - but I will do amazing things in your life as a Mom, Jolanthe...things that will amaze you and your children. Live in freedom and joy in this place of Motherhood, and I will carry you higher than you ever thought possible....and bring you more joy than you ever dreamed....and I will cause your heart to soar." This word was such an amazing encouragement to me and really "bookended" quite a few things that had been in my heart and prayed over me previously. 'Nuf said for now...check back for part three in this long-winded post. Sounds like you were really encouraged on your trip! Isn't it nice to have that escape occasionally. Consumed with food...or consuming food?